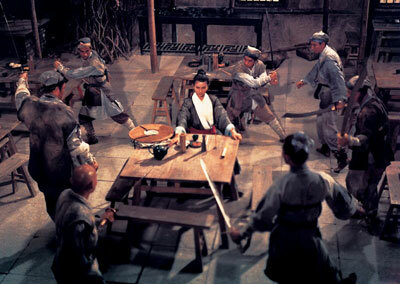 In wuxia, I think inns are even more of a staple than in medieval fantasy, and they are often where some of the most intense fighting action and drama unfolds. Lately I've been incorporating Inn Encounters in my games. These are random encounters that have a 2 in 10 chance of occurring at any inn the players go to (you can easily adjust these numbers to suit your preferences). Here is an example of a small Inn Encounter Table. Because they are specific events, I opted for a 1d10 table so the results have an even chance of coming up. I usually make about 2-4 of these periodically so things stay fresh and I have a lot to choose from (and I'll occasionally structure each table around themes, locations, times of year, etc). You can also use a 2d10 table if you prefer. I usually put together stat blocks for potential bad guys as well. That can be handy to have. If you make stat blocks I recommend including notes on any relevant abilities or Kung Fu Techniques. But pulling random NPCs or stat blocks from your campaign or from the rulebook also works just fine. Another assumption with these tables is that you expand on the details as things unfold. Some of these hint at deeper scenarios, so if the players pursue them, fleshing them out a bit on the fly will give you more bang for each entry. If tying things together during play isn't your style, fleshing out each event a bit before play can be handy. You can always do this when you make the table, but I find that is often counter-productive because the details are so dependent on where the PCs are when it arises. So taking existing tables and adding details right before or during the session can make them more relevant. The following encounters can work for similar locations like wine shops, restaurants and brothels. This is just one table. Ideally you have several such tables for different contexts. The players arrive in the wake of a fight. A scholar named Guo has just cut off the hand of a bandit who tried to grab his friend’s wife. All are calm, but it is obvious the scholar has just sheathed his blade. The Bandit, Yao Ming, sits with his men clutching his sleeve while his men glare. Yao Ming passes out in a round and dies in 4 without proper healing. Scholar Guo will try to prevent anyone from helping him. On a Detect TN 8 Roll the players see the severed hand beneath the table. After the players arrive, a gang of six assassins sent by an enemy come into the inn one by one. Each one takes a seat in a strategic position and gives the party an intimidating look. Pick random martial heroes from the rulebook or from you NPC list. Their reason for coming to kill the PCs is related to something the players have done in the past year. During the night the players hear sounds in the main dining area. If they awaken and investigate, they see the body of a Yen Li priest named Shan. He was stabbed in the chest nine times. Luckily the local Sheriff was staying at the inn. The Sheriff awakens and begins questioning everyone and assuring all the matter is under his control. He chews on a leg of chicken and uncouthly points the bone at potential suspects to make his points. However, minutes into this, he has trouble breathing, looks agitated, collapses and dies. He has been poisoned by Hellebore (Medicine TN 8 roll, Talent: Poison TN 6 to determine). See WHOG Rulebook page 98 for Hellebore. What is more, many of the drinks and food items are poisoned in the inn. Everyone has a 1 in 10 chance of being poisoned if they eat or drink within the next hour. The players are free to come, go or investigate the matter themselves. The truth of the matter is, the Sheriff and Yen Li Priest killed each other. They are old enemies. The Sheriff stabbed the priest but not before the priest made sure to poison every food item and drink the magistrate might consume. Someone wants an object that the players possess. They bribe the waiters and servers to slip Xi Kang’s Spine Freezing Wine (WHOG Rulebook page 99) into their wine. If the players are poisoned, one of the serving girls takes the object when they are paralyzed and transfer it quickly to the villains who are waiting outside the inn. An overzealous constable comes to the inn and tries to have the player characters arrested on charges of discord. Any combat or disruption they’ve been involved in the past few months will come back to haunt them. He has orders from the Sheriff backing him up and he has 6 swordsman with him. If you want to spice up the encounter, midway through the arrest an official whispers in his ear that the Sheriff was just found stabbed to death at another inn. He immediately puts the blame for the sheriff’s death on the players as well. The PCs arrive at the inn and see two rival martial sects are seated at different tables. Choose two relevant sects from the WHOG rulebook or from your personal campaign. Characters can sense the tension rising in the air and within ten minutes a massive fight breaks out between them. The players can choose to get involved or not. However each round there is a 2 in 10 chance for each character of being struck by a stray attack. A local merchant comes to the party’s table and politely greets them. He has heard of them by name and asks if they indeed the heroes he believes them to be. If so he drops to the ground and begs for their help. His son was recently murdered a powerful and wealthy Martial Expert who beat him to death for stealing some of his grain. He asks the players to get revenge for him. A woman approaches the party, she does not know them by name but says they look like righteous heroes and tells them that her daughter was recently kidnapped by a gang of thugs led by a man named Naga King. She says he is known for his Naga Palm technique and she begs them to rescue her daughter. In truth this is an ambush. Naga King is really one of the PCs old enemies laying a trap for them. A man dressed in fine clothes and showing a wide smile approaches the party. He says his name is Luo and he praises the party for their exploits. He asks if he can have the honor of sitting down and paying for their meal. He then orders them all the finest foods and engages them in witty banter. He carries on for as long as he can. In truth he is a charlatan, just trying to get a free meal. He takes the first opportunity to go speak with the waiter, telling him the party is ready for their bill, then sneaks out of the inn. A woman dressed in white and attended by 5 Mystic Sword Sect Disciples sits in the back of the inn (Detect TN 6 to notice). She occasionally looks at the players, but otherwise ignores them. In a case of mistaken identity they match the description of a group of heroes who killed two of her disciples by Bixie Lake. Her disciples walk over and politely ask to buy the party food and wine. They do this in order to surround them. They attack when the players seem most off-guard. Lady White Blade only joins the fight if her disciples have difficulty. See WHOG Rulebook page 235 for Lady White Blade and page 351 for the Mystic Sword Sect disciples (3 Junior, 2 Senior). Inns are very important in any wuxia. At least one battle is sure to occur there.